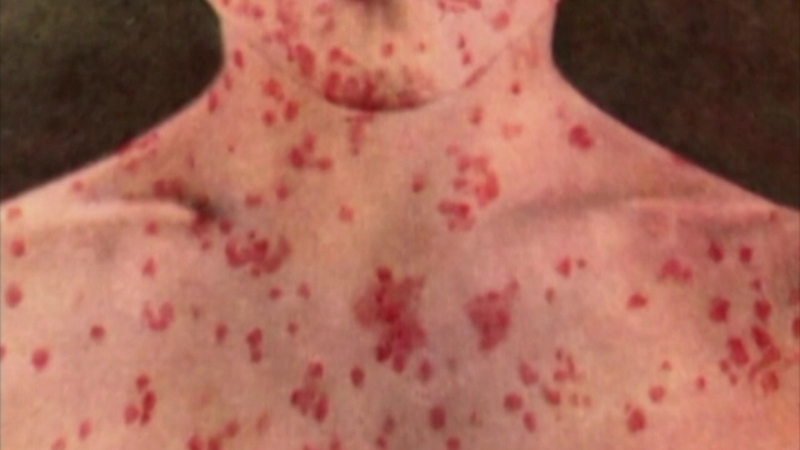 CHICAGO (WLS) -- Health officials have confirmed the state's 15th measles case in an adult in suburban Cook County. Exposures may have occurred at LaRosita Laundromat in Palatine on Feb. 16 between 7 a.m.-12:30 p.m. and Vista Clinic in Palatine on Feb. 19 between 9 a.m. and 4 p.m., officials said. Other details about the source of the case have not been released, although officials have said they do not believe it is linked with other previous cases. Measles has been reported in 14 people in suburban Cook County and one person in Chicago, officials said. Of those infected in suburban Cook County, three are adults and 11 are children. Twelve of those cases are associated with the outbreak earlier this month at a KinderCare in Palatine. Since the outbreak, the daycare has required all staff and adults to be vaccinated for the virus. Infants cannot receive the vaccination until they are a year old, but are encouraged to get the first dose between 12 and 15 months. The second dose should be given between the ages of 4 and 6. The outbreak has caused some lawmakers to propose legislation tightening child vaccination rules, making it more difficult for parents seeking exemption for religious reasons.